Elvis is one of the few people who will not coming to the Wine Country ‘Ukulele Festival, but you will be able to catch him on the silver screen for the first ever Wine Country ‘Ukulele Film Festival, Sunday, October 11, at 1:30 pm at the award winning Cameo Cinema in St. Helena. Ralph Shaw will be hosting the show and will loosen you up with a few bright numbers in anticipation of our guest performers: the dancers of Hiva Nui and Uncle Mike Keale, cousin of the late, great Israel Kamakawiwo’ole (“IZ” of “Somewhere Over the Rainbow” fame) and nephew of award-winning traditional Hawaiian music vocalist, Moe Keale. 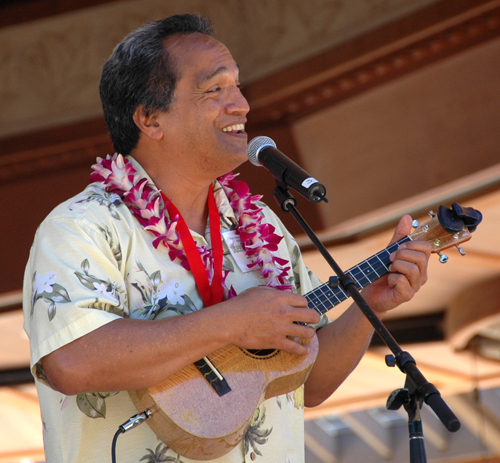 Mike Keale is an important Hawaiian music performer in his own right and has kept his family’s Hawaiian music legacy alive performing at prestigious Waikiki venues such as the historic Royal Hawaiian and Moana Hotels, the Prince Kuhio Hotel, and the Marriott Waikiki’s Moana Terrace Lounge. 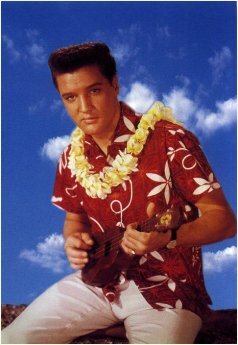 This alone would be well worth the price of admission (only $10), but there’s also the movie, that wonderful classic, “Blue Hawai’i.” ‘Ukuleles are not required, but if you have one, bring it along and strum-a-long with Elvis as he “rocks a hula baby” with you. What a perfect way to close out a truly wonderful weekend. And while you’re here, don’t forget to check out the latest entries in the YouTube Commercial contest. Be sure to visit the new 2009 Festival page for the Schedule of Events (as it looks right now) and a list of some of the talent headed our way this year. We will flesh this out with more detailed explanations of each event (and the prices) shortly. In the meantime, please note that we have a full week-end of ‘ukulele fun in store. Also be sure to check out the Festival Poster page where you can download and print out your own fliers to post prominently, wherever you think ‘ukulele and/or music buffs would like to see them. Your help in getting the word out about the festival is sincerely appreciated. The more the merrier. Thanks to the generosity of the Petalukes, our ‘ukulele-strumming buddies over in Petaluma, we are once again able to put on a performance for the veterans residing at the California Veteran’s Home in Yountville. Last year we were able to treat the vets to the sweet sights and sounds of Hawai’i with Robyn Kneubuhl, KonaBob Stoffer, Mark Nelson, and Liko Puha. This year, the inimitable Ralph Shaw will keep ’em hopping with his usual, zany, off-the-wall antics. (Who can forget his song from last year, describing how to build an ‘ukulele case? In case you missed it, click on the photo of Ralph, taken by Lori Ikeda-Lowe at last year’s festival.) Don’t worry, there’s plenty of Ralph to go around. Festival attendees will be able to catch his act at Beringer Vineyards on Saturday AND take a couple of workshops from him. He’ll be popping in and out of some of the other events through-out the week-end, as well. A big welcome goes out to our new sponsor, JVC, who is providing the Everio camcorders for use in the Kala UkeTube Booth, where festival attendees will have an opportunity to strum their stuff in a semi-private forum, under semi-professional circumstances, for world-wide distribution. We’ll have more details on this later. But, for the time being, you might want to start thinking about what song you’dlike to perform for the world at large. 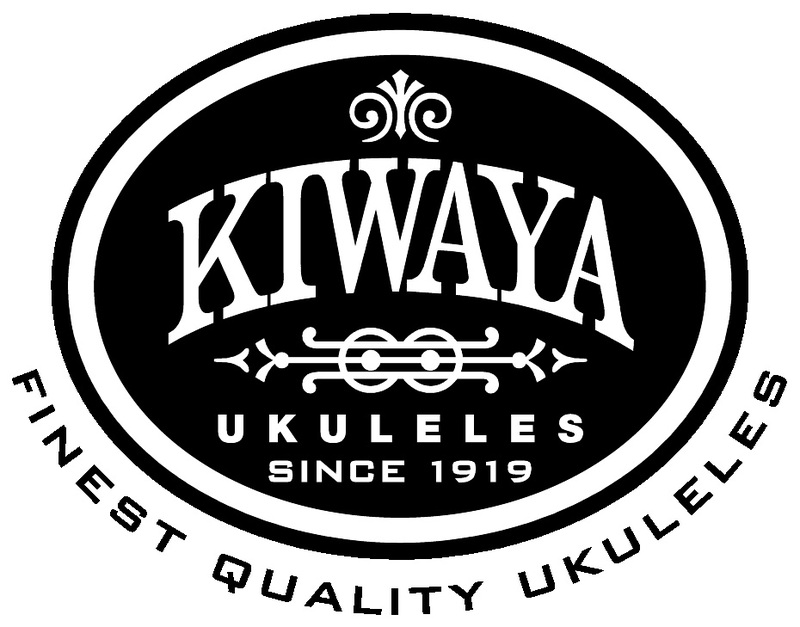 Thanks to the support of JVC and Kala Ukuleles, the UkeTube Booth will be in operation throughout the day on Saturday, October 10, at Beringer Vineyards. And while we’re on the subject of Saturday’s events, feel free to bring along any curious friends or family members who haven’t yet caught the bug (bug? flea? get it?) and drop them off at Frank Novicki’s Rapid Uke 101 booth, where Frank will have them humming and strumming in a quick 30 minutes. Don’t worry if they don’t have an ‘ukulele, yet; we’ll make one available for them. Frank is also a valued member of the Maika’i Gents, who will be performing at the Judd’s Hill Hula Party on Friday, October 9. If you plan attending that, don’t forget to bring your gently used (but now unused) slippahs to donate to Soles4Souls, the primary beneficiary of the Friday night event. Nashville-based Soles4Souls™ facilitates the donation of new and used shoes and has distributed more than 4.3 million pairs (currently donating one pair every 17 seconds) to people in over 125 countries, including Honduras, Uganda, Romania, and the United States. We’ll have a collection box at the Hula Party where you can deposit the shoes you don’t want to take back home with you. Aloha kakou. E komo mai! There are so many exciting things happening with this year’s festival, I hardly know where to begin. We better start with the dates. It’s official. The 2009 (and 2nd annual) Wine Country ‘Ukulele Festival will run from Oct. 9 – 11. So far we have the following instructors and performers lined-up: James Hill, Ralph Shaw, Victoria Vox, Kimo Hussey, Faith Ako, Steven Espaniola, the Dominator, Michelle Kiba, Liko Puha, the Makai Gents, and I’m sure we’ll be adding more. We also have two Napa Valley wineries on board–Judd’s Hill and Flora Springs–both with a couple of ‘ukulele enthusiasts on staff. (‘Ukuleles pair very well, it turns out, with most wines. ) I’ve got a couple of other wineries on the line who also want to be a part of this, so stay tuned. We’re still finalizing the different events and sorting out who’s going to be where and when, but in the meantime, rest assured that the workshops, held again at the Upper Valley Campus of Napa Valley College, will be top-notch, and if there’s enough interest they will extend into Sunday morning. I know a number of you are anxious to get your room reservations and the earlier the better; it’s a very popular time of year here in the Napa Valley. Harvest is generally still in full swing and the Valley is ripe with the smell of fermentation. Calistoga would be a great place to stay and is just about 10 minutes up the road from St. Helena. And you can take a soothing mud bath after (or before) your busy ‘ukulele day. At this writing, there seems to be availability in all price ranges. Check out Calistoga Fun for all the options. And don’t forget: the deadline for our logo design contest is Friday April 24. We’re looking for something bright and colorful that will convey all the fun and friendship we will enjoy at this year’s Wine Country ‘Ukulele Festival. The prize for the winning entry is a lovely koa soprano ‘ukulele, SK-300G, generously donated by Ohana. Send your entries to me at elainede@sbcglobal.net and put “WCUF logo contest” in the subject line. And while we are having fun making music and new friends, we will have a chance to do some good as well. This year we have teamed up with a couple of charitable affiliates and will probably be adding more as the festival unfolds. The first is Soles4Souls, a 501 (c) (3), based on a very simple concept: get shoes and give them away. Over 300 million children in the world are without shoes–roughly the same number of shoes that we in the United States throw away every year. And some 1.3 billion hookworm infections (transmitted through the feet when walking without shoes) have been accounted for world-wide. Well here’s a chance to make a huge difference in someone’s life with a very simple act. Bring those gently-worn shoes cluttering your closet to the Judd’s Hill ‘Ukulele Extravaganza on Friday, October 9, and turn them in for an opportunity to win some fabulous raffle prizes. The more shoes you bring in, the cleaner your closet, the more chances you have to win, and the more shoes we can send. Win, win, win. How simple is that? Not only that, the Wine Country ‘Ukulele Festival is a Daniel Pearl World Music Days event, part of an international network of concerts, featuring 3,100 performances in 84 countries, all using the universal language of music to encourage fellowship, raise awareness, and affirm our commitment to tolerance and humanity. Daniel Pearl is the Wall Street Journal reporter who was kidnapped and murdered in Pakistan in 2002. October 10 is his birthday. We will celebrate it in style. Be sure to check out the Scenes from 2008 and Festival Store pages above. And don’t forget to Subscribe so you can be notified automatically as we update information about the festival on this site. Stay tuned. There’s lots more to come.